The Roland TD-30K is the industry standard V-Drums V-Pro series of electronic drum kits. For players that want to improve the feel and sound.. 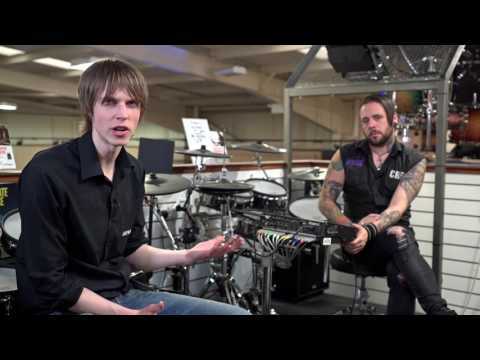 The Roland TD-30K is the industry standard V-Drums V-Pro series of electronic drum kits. For players that want to improve the feel and sound for studio recording or intensive home practice, or even to take out on the road on tour - the TD30K delivers. Get a great deal on the last of the Roland TD-30K Drum Kits available at PMT Stores Nationwide. The last of our remaining stock will be Ex-Demo or out on Display with minor signs of use. Original Boxes may be unavailable so In-Store Collection advised. Call our Sales Team for more information - We won't be beaten on price! Through extensive research and development, Roland have produced their flagship V-Drums kit in the Roland TD-30K electronic drum kit. Using the feature-packed TD-30 drum module with the SuperNATURAL sound engine and high quality mesh heads, the Roland TD-30K is an incredible kit that is perfect for professional drummers. 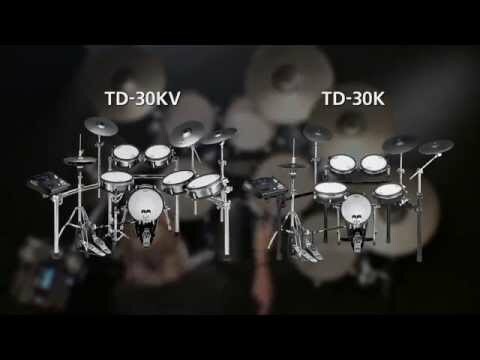 Powering the Roland TD30K electronic drum kit is the TD-30 drum module, providing you with a huge range of acoustic and electronic percussion sounds, and great features. 1000 built-in sounds along with great effects with a dedicated “ambience fader” allow you to get the exact sound you’re looking for. USB allows for MIDI/AUDIO connectivity and data storage which is perfect for connecting up other devices, loading in new sounds, recording your performances and practicing with virtually limitless potential. Originally developed for Roland pianos, the SuperNATURAL sound engine offers incredible audio and amazingly natural response through a mixture of sampled and modelled sounds and behaviour modelling. The result is a sound engine that produces incredibly lifelike sounds while emulating the physics involved when playing an acoustic drum kit to give you an extremely authentic and realistic sound when playing. For the snare drum, the Roland TD-30K has a 12-inch, PD-125 mesh V-Pad which features Roland’s own dual-triggering technology which gives you incredibly accurate and even sensing between the head and the rim. The toms come in the form of PDX-100 10-inch mesh head V-Pads which have a dual-mount option, giving you more flexibility for the perfect setup. A KD-120 12-inch V-Kick trigger pad is provided as the kick drum of this electronic drum kit, offering you fast, natural kick-drum triggering. It is also sized to be compatible with double bass pedals. Allowing you to get the perfect feel, the head tension of the KD-120BK can be adjusted while rubber tipped legs with hidden spikes ensure amazing stability while you perform. The VH-11 floating hi-hat in this TD-30K kit is made up of an innovative floating cymbal pad over a fixed lower base, giving it an amazingly realistic feel. If blindfolded, even the most seasoned of drums would think they’re playing on a conventional two-piece hi-hat. Also included are the acclaimed V-Cymbal Crash pads. Optimised for perfect weight-balance and sensitivity, they provide you with a beautifully natural swinging motion and precise triggering, allowing for consistent performance and choke control. With the V-Cymbal Ride’s enlarged bow area, you get an improved playing feel while its three-way triggering allowing for different sounds to be produced by playing either the edge, bow or bell. Unsure which kit might be for you? Check out our Roland Electric Drum Kits comparison page and see all the differences between the Roland Drums. * Additional Shipping Charges may apply for this item. Please call us on 0151 448 2089 and we'll be happy to advise.